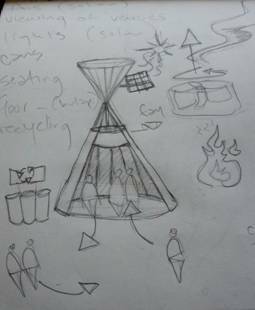 Mission: To create a model smoking station unit, variable in size, aesthetically pleasing, contained, functional for both smokers and non-smokers, non-permanent structure, that can be effectively implemented wherever necessary. Must be attractive. A tee-pee comes to mind, both attractive and ventilated, as well as consistent with our image if done correctly. Fans: Preferably solar powered. For ventilation and exhaust. Venue Viewing: Especially in future stage developments of our event. Not feeling like you have to leave the party in order to smoke. Please keep in mind when considering Smoking Stations for 2013 that these units are conceptual and gesture toward both the public whom desire better accommodations as well as public who wish to have a greater barrier between non-smoking and smoking areas. Solar panels satisfy our desire to present as sustainable and responsible. We have found (with help from Paxton) Fans that are large enough to move a sufficient amount of sq ft as well as run on 12v (maximum capacity of solar power). This year may be tough to implement the full vision, but we are on the right track. The second is a TEE PEE structure like the one on page one. Sites in mind are politics park or by the sauna. Floor of 17’ diameter.